The Embassy of India, Kathmandu celebrated the 70th Republic Day of India on 26 January 2019. 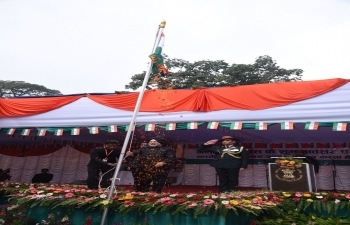 Ambassador of India to Nepal Shri Manjeev Singh Puri hoisted the national flag and read out the President of India’s message on the occasion. The Flag hoisting ceremony was attended by over 1500 Indians and friends of India. The students of the Kendriya Vidyalaya, the Modern Indian School and the Swami Vivekananda Culture Centre, Kathmandu sung patriotic songs followed by a scintillating performance by the Nepal Army Band. Later in the day, the Ambassador hosted a reception at India House. Rt. Hon’ble Vice President of Nepal Mr. Nanda Bahadur Pun graced the occasion as the Chief Guest. On this occasion, to mark the Seven Decades of India-Nepal diplomatic ties, a book titled “India & Nepal- 70 Years of Diplomatic ties” was also released by Rt. Hon’ble Vice President of Nepal along with the Ambassador. The event was attended by more than 1000 dignitaries, including senior political leaders & public personalities.